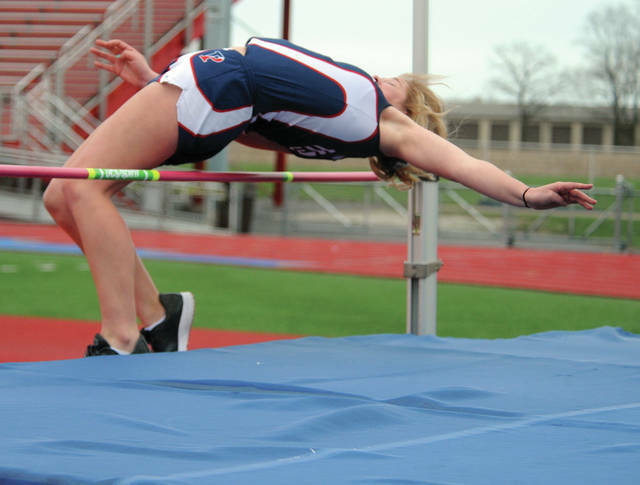 Piqua’s Aubree Schrubb clears the bar in the high jump Wednesday at Alexander Stadium/Purk Field. Piqua’s Tyrese Mixon puts the shot Wednesday. Piqua’s Desiree Warner runs the 100-meter hurdles Wednesday. 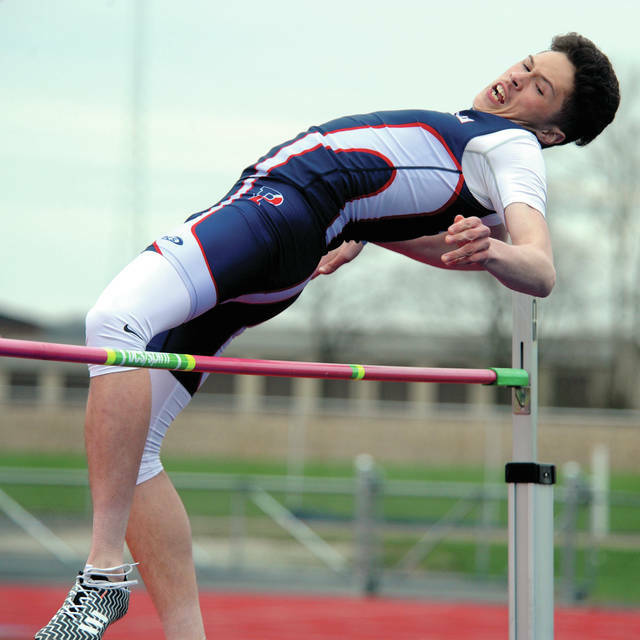 Piqua’s Owen Curtis competes in the high jump Wednesday. 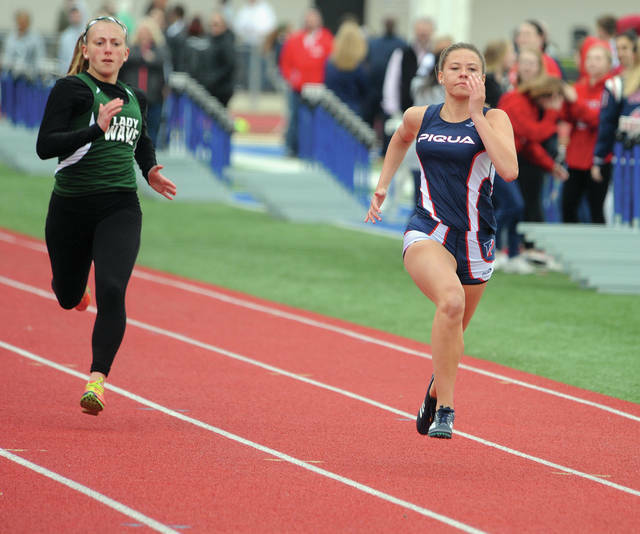 Piqua’s Whitney Evans heads towards the finish line in the 100-meter dash Wednesday. 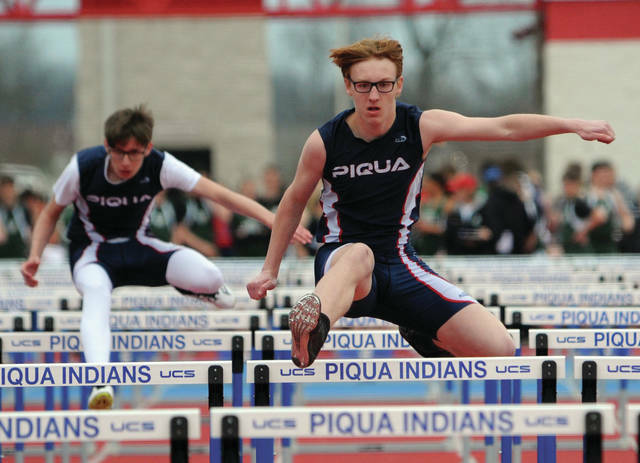 Piqua’s Ethan Heidenreich (in front) and Nick Heidenreich run the 110-meter high hurdles Wednesday. Jasiah Medley leans at the finish line in the 100-meter dash Wednesday. 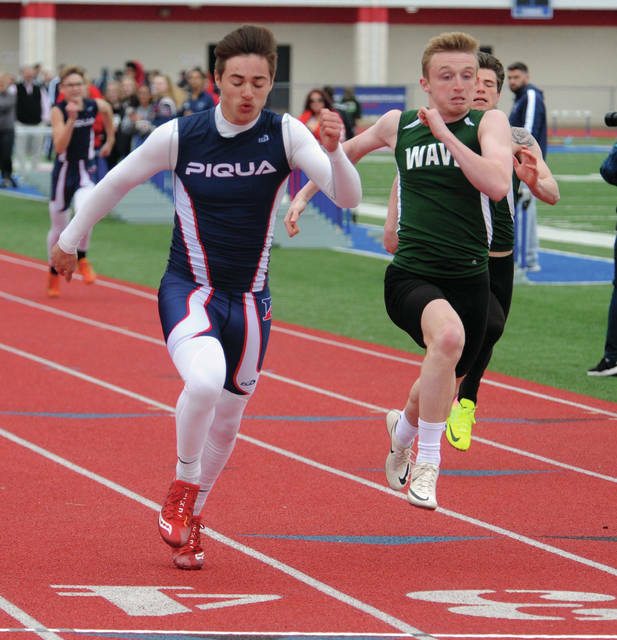 PIQUA —- The Piqua boys and girls track and field teams had their only home meet of the season Wednesday. The Piqua boys lost to Greenville 91-48, while the girls won 106-34. Winning for the boys were Jasiah Medley, 100, 11.63; Ethan Heidenreich, 300 hurdles, 46.91; Jesse Furman, 800, 22:26.24; the 1,600 relay, 3:59.50; and the 3,200 relay, 9:05.22. 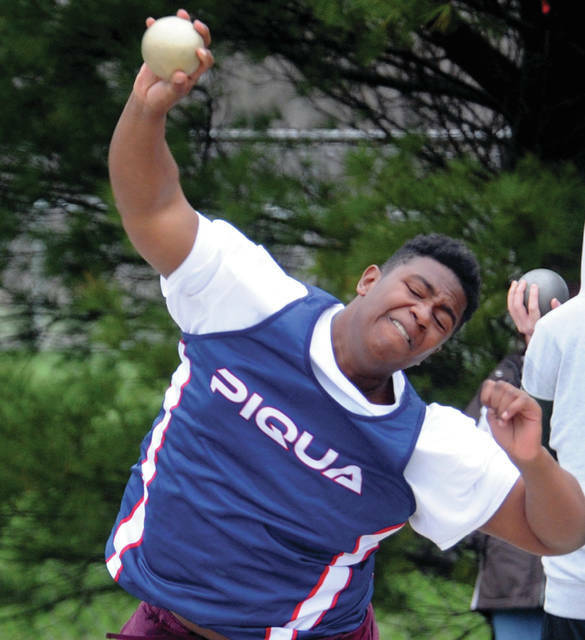 Claire Bim-Merle led the Piqua girls sweeping the shot put, 29-9 and discus, 74-5. Also winning were Lauryn Mitchell, 100 hurdles, 18.68; Adde Honeycutt, 100, 14.10; Maeve Vulcan, 1,600, 6:26.20; Hailey McPherson, 400, 70.35; Colleen Cox, 200, 28.09; Alivia Knorr-Sullivan, 14:28.49; Aubree Schrubb, high jump, 4-6; the 400 relay, 57.40; the 800 relay, 1:58.70; the 1,600 relay, 4:49.31; and the 3,200 relay, 11:40.84. Piqua will run at the Butler Invitational Saturday. SIDNEY —- The Russia boys and girls track and field teams swept a six-team meet at Sidney Tuesday. Boys team scores were Russia 115, Houston 97, Fairlawn 91, Botkins 45, Jackson Center 16, Sidney Christian Academy 8. Jason Siefring led Russia, sweeping the 110 hurdles, 16.86; and long jump, 18-5. Also winning for Russia were Jonathan Bell, 3,200, 11:37.54; Michael York, shot put, 44-1 1-2; Max Bohman, pole vault, 11-6; and the ironman relay, 57.87. Winning for Houston were Tristin Freistuhler, 1,600, 4:51.81; Wesley Jester, 300 hurdles, 46.46; Ethan Knouff, 800, 2:03.39; the 1,600 relay, 3:38.43; and the 3,200 relay, 8:59.35. Girls team scores were Russia 87, Botkins 81, Houston 74, Fairlawn 69, Jackson Center 44, Sidney Christian Academy 12. Winning for Russia were Becca Seger, 800, 2:28.80; Ella Hoehne, high jump, 4-6; Sarah Pinchot, pole vault, 10-0; and the 3,200 relay, 10:26.04. Winning for Houston were Hollie Voisard, 1,600, 5:50.97; and the 1,600 relay, 3:38.43. MARIA STEIN —- The Versailles boys and girls track and field teams both competed in a quad meet at Marion Local Tuesday. Boys team scores were Fort Loramie 79, St. Marys 75, Marion Local 69, Versailles 34. Girls team scores were Marion Local 78, Fort Loramie 76, Versailles 54.5, St. Marys 41.5. Winning for Versailles were Ava Moran, 200, 27.04; Lucy Prakel, pole vault, 10-0; and Haley Mangen, discus, 92-5.
https://www.dailycall.com/wp-content/uploads/sites/30/2019/04/web1_041019mju_track_phs_aubreeschrubb.jpgPiqua’s Aubree Schrubb clears the bar in the high jump Wednesday at Alexander Stadium/Purk Field. https://www.dailycall.com/wp-content/uploads/sites/30/2019/04/web1_041019mju_track_phs_tyresemixon.jpgPiqua’s Tyrese Mixon puts the shot Wednesday. 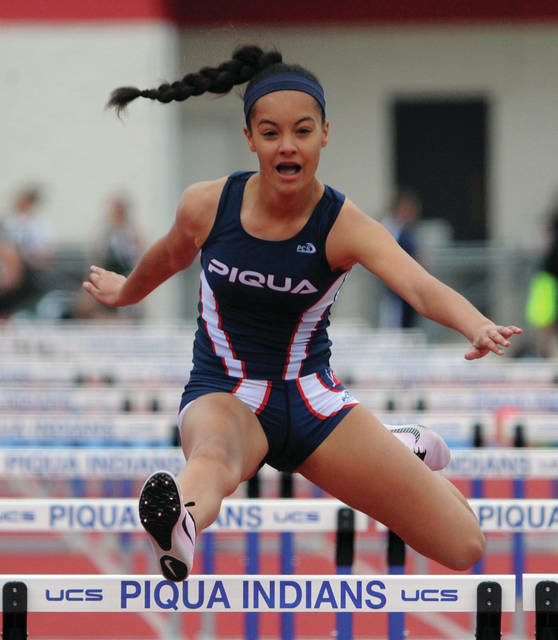 https://www.dailycall.com/wp-content/uploads/sites/30/2019/04/web1_041019mju_track_phs_dwarner.jpgPiqua’s Desiree Warner runs the 100-meter hurdles Wednesday. https://www.dailycall.com/wp-content/uploads/sites/30/2019/04/web1_041019mju_track_phs_owencurtis.jpgPiqua’s Owen Curtis competes in the high jump Wednesday. https://www.dailycall.com/wp-content/uploads/sites/30/2019/04/web1_041019mju_track_phs_evans.jpgPiqua’s Whitney Evans heads towards the finish line in the 100-meter dash Wednesday. https://www.dailycall.com/wp-content/uploads/sites/30/2019/04/web1_041019mju_track_phs_heidenreich.jpgPiqua’s Ethan Heidenreich (in front) and Nick Heidenreich run the 110-meter high hurdles Wednesday. https://www.dailycall.com/wp-content/uploads/sites/30/2019/04/web1_041019mju_track_phs_medley.jpgJasiah Medley leans at the finish line in the 100-meter dash Wednesday.